The first day of Spring. The Vernal Equinox! The Latin translation - spring of equal night. Did you know that if you were standing or floating as the case may be, on the equator during the Vernal Equinox, it is one of two days (the other being the autumnal equinox) in which you could see the sun pass directly overhead. But I'm sure you already knew that. One of these years, I'd like to be at the equator when that happens. I love Spring - nice sunny days, sitting on the patio, listening to the birds, watching the baby birds attempting their first flights and the mommy birds chasing my cats into the house, working in the garden and most of all, reading. I even remodeled the blog for spring. How do you like my new look? All of which brings me to Katrina's Spring Reading Thing 2010. Every year, Katrina of Callapidder Day's hosts Spring Reading Thing which is a very casual, low pressure reading challenge. Write a blog post containing your list and submit it to this post using the Mr. Linky. Get reading! The challenge goes from today, March 20th, through June 20th, 2010. 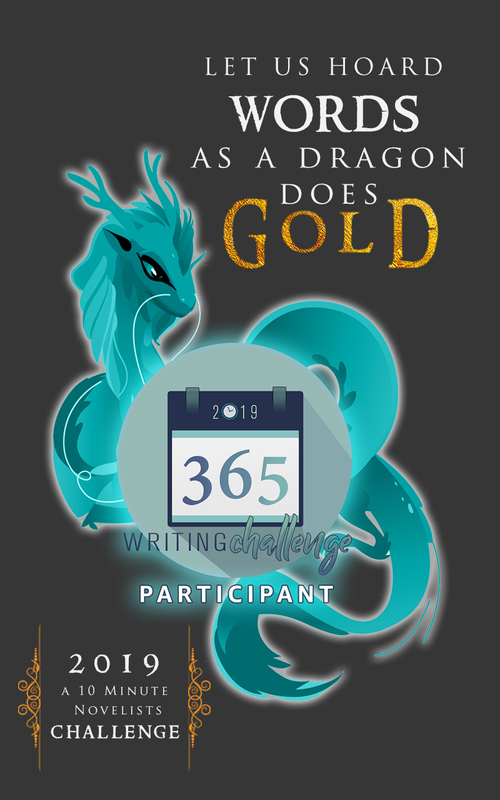 Write a post about your challenge experience in June, telling us all about whether you reached your goals and how the Spring Reading Thing went for you. But remember: this is a low-pressure challenge that should be fun. As long as you do some reading this spring (and enjoy it! ), that’s good enough for me. I'm going to continue with my theme - New to Me Authors. Plus I'm going to be traveling all over the globe. Besides the books I'll be reading for TLC Tours (info will be posted in my sidebar soon) and my Nobel Literature class, who are all authors I've never read before, I'll be reading books from the genres: non fiction, classics, historical fiction, science fiction, mystery and young adult currently on my TBR shelves. Which equals out to about one book a week. 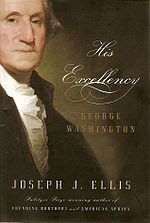 His Excellency George Washington by Joseph Ellis: We are studying American history right now and I decided that I needed to educate myself about the Presidents, so joined the U.S.Presidents Reading Project. The Scarlet and The Black by J.P. Gallagher -The True Story of Monsignor Hugh O Flaherty, Hero of the Vatican Underground. I had seen this book numerous times in the Ignatius Press Catalog and was intrigued. When joined the Colorful Reading Challenge, decided it was a perfect time to get the book and read it. The Stargazer: A Novel of the Life of Galileo by Zsolt De Harsanyi. 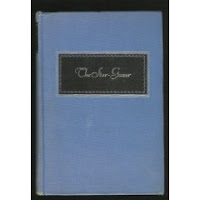 It's an oldie from 1939 that's been sitting on our shelves for a while and has been calling my name for some time. Because I have it and haven't read it yet. 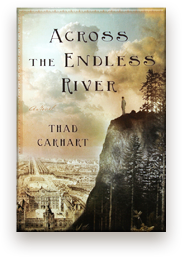 Across the Endless River by Thad Carhart: A historical fiction novel about Jean-Baptiste Charbonneau, the son of Sacagawea, his travels in 1820’s Europe. The Road to Jerusalem by Jan Guillou: It is the first in the Crusade Trilogy and starts off in the 1100's in Sweden. People of the Book by Geraldine Brooks: A rare book export is given the opportunity to restore a illuminated Hebrew manuscript, the Sarajevo Haggadah. The story traces the journey of the manuscript through five centuries of history. Read about the dystopian novel on Beth Fish Reads and just had to get it. About four artists - two in 1960's Italy and two in present time Britain - a dying painter, a blind girl, a landscape artist, and an art curator. Sounded intriguing. Liars Anonymous by Louise Ure: By one of the many mystery authors who blogs at Murderati. I'm slowly making my way through and reading books by every author. Shapeshifter: The Demo Tapes year 1 and year 2 by Susan Helen Gottfried. (e-book format) Collection of short fiction about the fiction band Shapeshifters and their world. 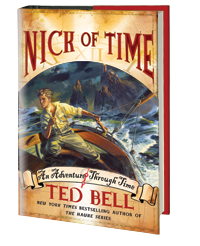 Nick of Time by Ted Bell. I heard about this author and the book on one of the Fox News Evening shows and it sounded really interesting. Set in the 1930's during the war and Nick finds a time travel machine in an old sea chest. Pirates, nazi's, time travel - sounds like an interesting read. 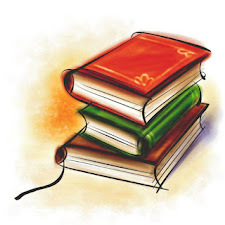 To join in the Spring Reading Thing Challenge, make your reading plan and head on over to Callapidder Day's to sign up. Your list is quite diverse! I really enjoyed Genesis by Bernard Beckett! And Time Travelers Wife has been in my tbr pile forever. Great reading list! Have a good spring! I love the diversity in your list, too! Makes for a well-rounded person. :-) Hope you enjoy! I love Dorian Gray and You will love Time travelers wife. Thanks for stopping by my blog. Great variety there! I need to check out Time-Traveler's Wife -- I've seen it referred to on so many lists. Great pics! Liars Anonymous has me interested. A very interesting and varied list. Happy reading. Awesome reading list! I've bowed out of this one this year. I need to finish some before I join more. And I've already committed to the cozy mystery challenge coming up. People of the Book is one of my favorite reads this year. It has so many layers to it. Hope you like it! I also enjoyed The Time Traveler's Wife. Good luck with the challenge. Great line ip of books for your Spring reading. Nick of Time was wonderful. The Scarlet and The Black looks interesting. I like your reading list... going to add a few to mines. The Time Travelers Wife book is much better than the movie. Happy Spring to YOU TOO! Your list looks great. Especially since I've not read any of them and many of them look so great I have added them to a future TBR list. Good luck and have fun. You always have a great list of books! This year doesn't disappoint either. Happy Reading! Yay The Time Traveler's Wife! I hope you love it! Great list -- lots of variety! I think I was the only person in my high school class who liked The Picture of Dorian Gray. I don't know why, but I really did like it. My husband listened to the audio version of Nick of time and said it was a good one -- I need to read that one of these days. Thanks for being part of the challenge. Enjoy your spring reading, and all the other wonderful things that come along with spring! But, man, it's cool to see them there.